Robocop Robocopy - Frequently asked Questions. Installation - Do I need to install? How do I uninstall Robocop Robocopy? 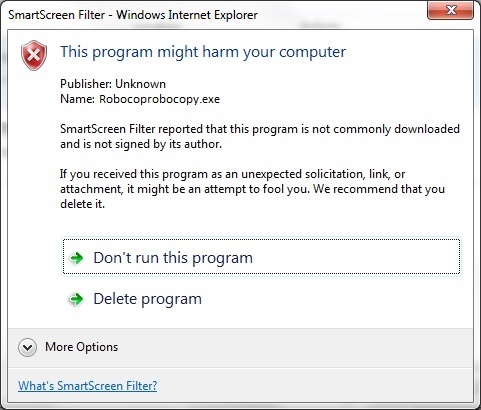 Why has Windows SmartScreen filter has blocked Robocop Robocopy from running? My antivirus software says Robocop Robocopy is a virus. How do I know it's safe? Robocopy.exe can not be found....where can I get a copy of Robocopy.exe? How do I access the advanced robocopy options? Want to ask your own question about Robocop Robocopy? The short answer is no...there is no installation required, just run Robocop Robocopy straight from the program exe. 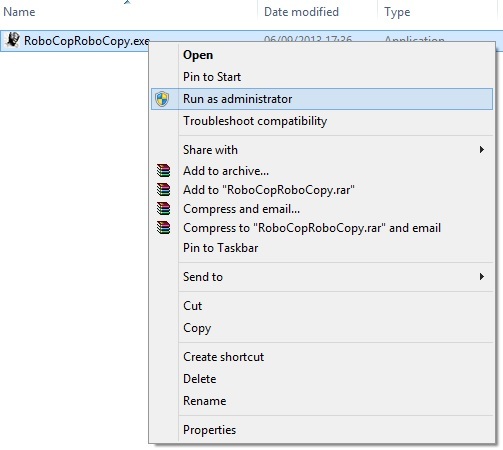 Windows integration (right click options) for Robocop Robocopy are installed by default on first run but only if the application is run as an administrator or the current user has administrator privileges. 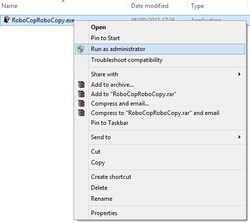 To add Windows integration to Robocop Robocopy run the exe as administrator or a user with admin permissions, click on the settings button and access the General Settings tab then click on the 'Context Menu' check box to Install the right click options. To remove Windows integration uncheck the 'Context Menu' checkbox..
How do I uninstall Robocop Robocopy (version 2.6.1)? HKEY_CLASSES_ROOT\Folder\shell\RoboCop RoboCopy Source\command", "", """C:\temp\RoboCopRoboCopy\RoboRC.bat"" 1 ""%1"
HKEY_CLASSES_ROOT\Folder\shell\RoboCop RoboCopy Destination\command", "", """C:\temp\RoboCopRoboCopy\RoboRC.bat"" 2 ""%1"
Open Robocoprobocopy.exe as an administrator - use runas and select administrator. Click on the 'i' information button to bring up the help and settings page. Click on 'Uninstall R-Click Options' link. There are also two files located at c:\temp\robocoprobocopy that will need to be deleted. These files enable the Windows integration right click options to automatically launch the program. Delete the c:\temp\robocoprobocopy directory to remove these files. Alternatively download the latest version of Robocop Robocopy (version 3.0.0.0 +) and select to uninstall Robocop Robocopy from the 'General Settings' menu. This is the easiest way to remove Robocop Robocopy. Why has Windows SmartScreen Filter blocked Robocop Robocopy from running? 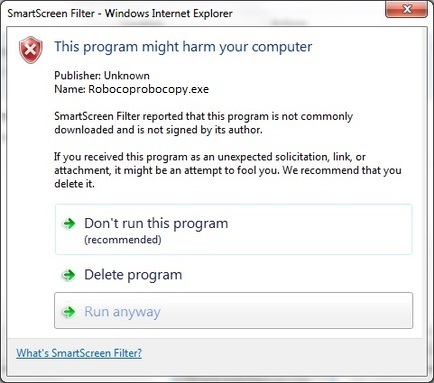 Windows 7 and 8 prevents Robocop Robocopy from running for the first time due to the default SmartScreen filter that checks unrecognized published files downloaded from the internet. To move forward from this click the 'More Options' button on Win 7 or the 'More info' label on Win 8 then select to 'Run Anyway'. After this one off the SmartScreen filter will not try to block Robocop Robocopy from running. If your antivirus software detects Robocop Robocopy as a virus it is doing a good job! Robocop Robocopy is not in any antivirus software definition list and to antivirus software it looks like a virus....probably a bad one. 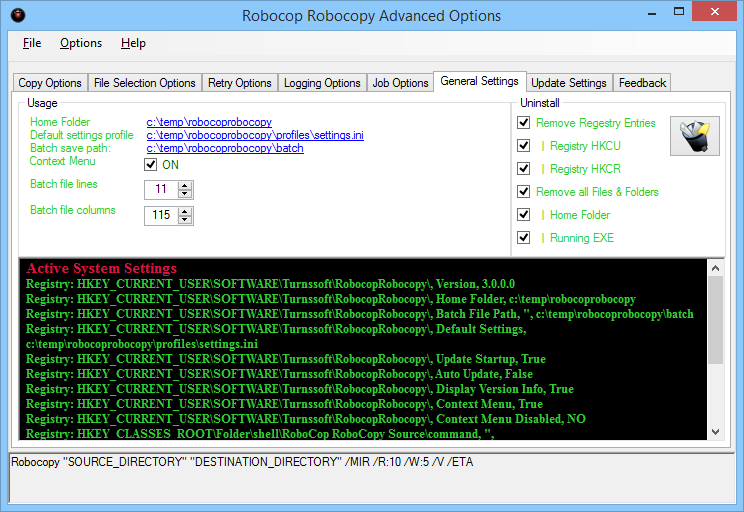 Robocop Robocopy is not a virus and has been certified 100% virus and malware free by one of the internet's top software distribution and file downloading sites; http://www.softpedia.com/. Software that Softpedia.com chooses to upload to there site is vetted and scanned for malware by a Softpedia technician. It is then certified virus free. How can I access the advanced robocopy options? Robocopy.exe can not be found...where can I get a copy of Robocopy.exe? 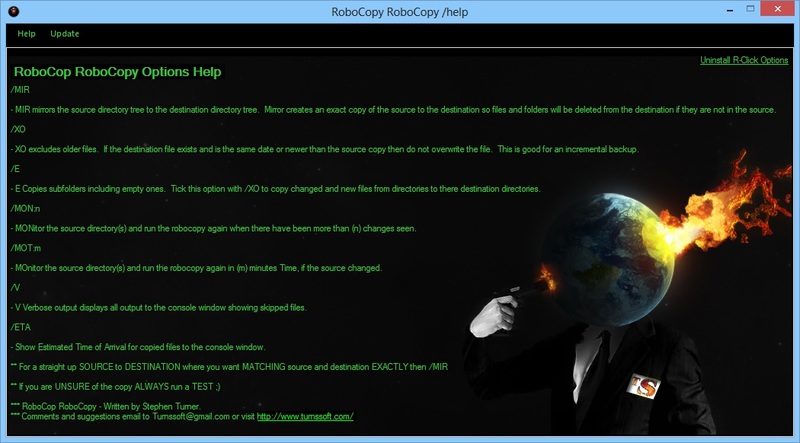 Robocop Robocopy is a script generator and GUI skin for Robocopy.exe. Without Robocopy.exe the robocopy scripts can not be run. Robocopy.exe was first introduced as a standard feature with Windows Vista and server 2008 however is not standard with Windows XP. After a quick Google search I was unable to find any reliable single download instances of Robocopy.exe so if you are reading this and know of a URL to download the single file exe please let me know and I will add the link. Want something added to the FAQ? Do you have an idea for an improvement? Submit a question below and you will receive an answer.